Protect Your Tools From Rust! It’s a type of microcrystalline wax that we use to protect our metal tools. Waxes tend to last longer and protect better than other materials, such as oil. The wax will create a protective barrier between your tools and moisture/oxygen, which can do them damage (e.g. rust or oxidize). You’ll want to use this product on the metal tools (steel or brass) that you touch most with your hands. We use it often on head knives, pricking irons, creases, punches, bevelers, etc. 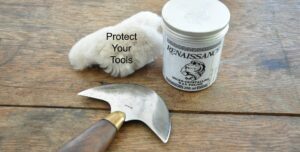 To use, apply a thin coat of wax evenly over your tools, and then buff lightly with a soft clean cloth or a piece of sheepskin. You’ll need to re-apply every so often. If you’ve got a damp shop, you might consider applying every 2 months. If you’re in a more dry location, you could consider re-applying every 6-8 months. The small tin should last you a good long time. We sell the 65 ml tins in our shop! Contact for details!